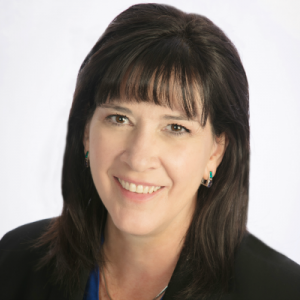 Have you ever wanted a heating pad, or an electric blanket or even a water bottle, but didn’t have one, or they were too expensive, or took up too much room? No problem! 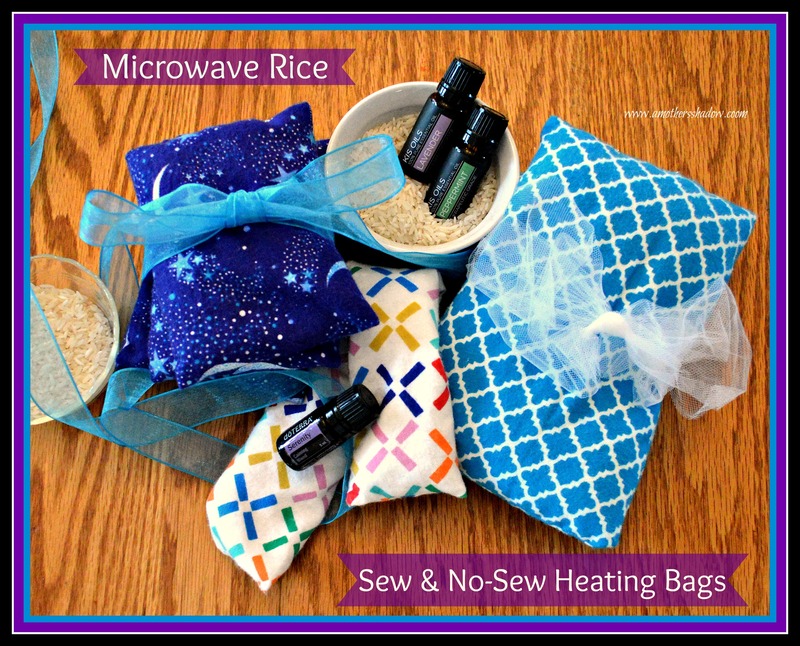 These microwave bags are perfect for those aches, pains and actually have so many uses. Did you know they can also be put in the freezer to be used as a cold press also?! These are so handy to have on hand, and give as gifts that I have some patterns and tutorials of how you can make them up quick. 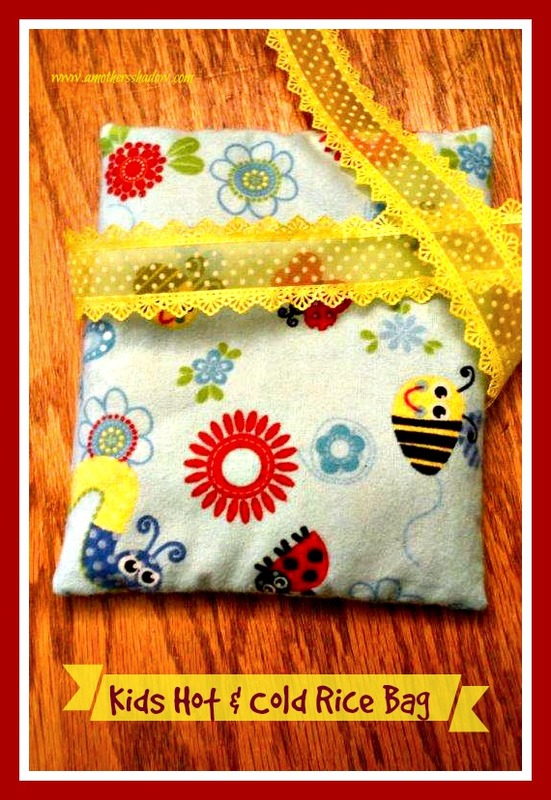 The beautiful part is you don’t have to have to be much of a sewer; actually, I have a TWO NO-SEW microwave heating bags so everyone can make these! You will love having this on hand for: headaches/migraines, on your jaw if you have tmj, menstrual cramps, to help ease the pains of arthritis, general body aches, bumps and bruises, even to warm up after being outside on a cold day. From the freezer they are great for: sprains, bumps, bruises, and anytime a cold press is helpful. 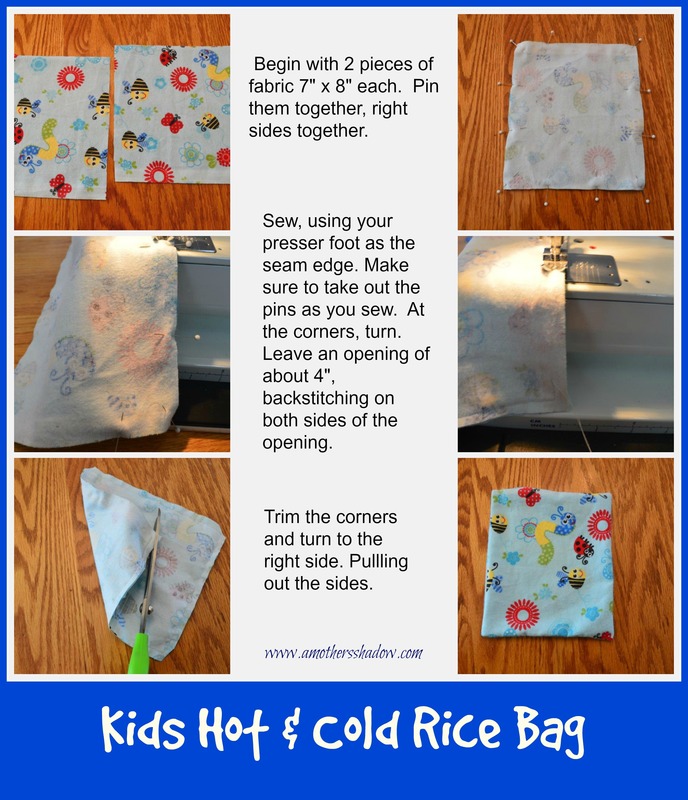 So come along and let’s make up some very easy sew OR no-sew rice bags. Also, if you have pets to warm up, or I even read that some mom’s use these against the tummy of a colicky baby for quick relief (check with your doctor on this one first please, and do not warm too much of course), these work wonders! 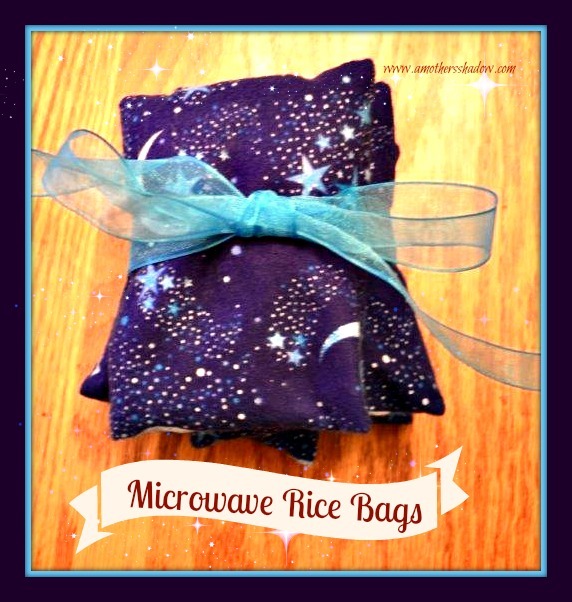 TIP*** When heating the rice bag, not matter what kind you make here, place in the microwave along WITH a cup of water (this will provide moist heat and prevent the rice from scorching in the microwave) and heat for approx. 1-3 minutes. Shake to distribute the heat and make sure it is not too hot before giving to a child particularly. 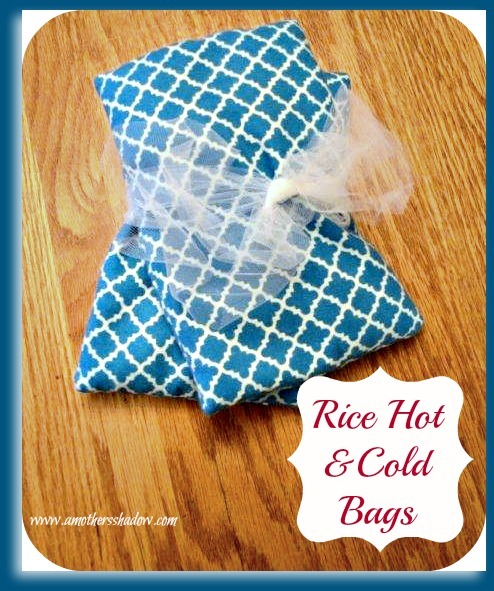 For cold packs, place in freezer for at least 45 minutes to allow time for the rice to chill thoroughly. 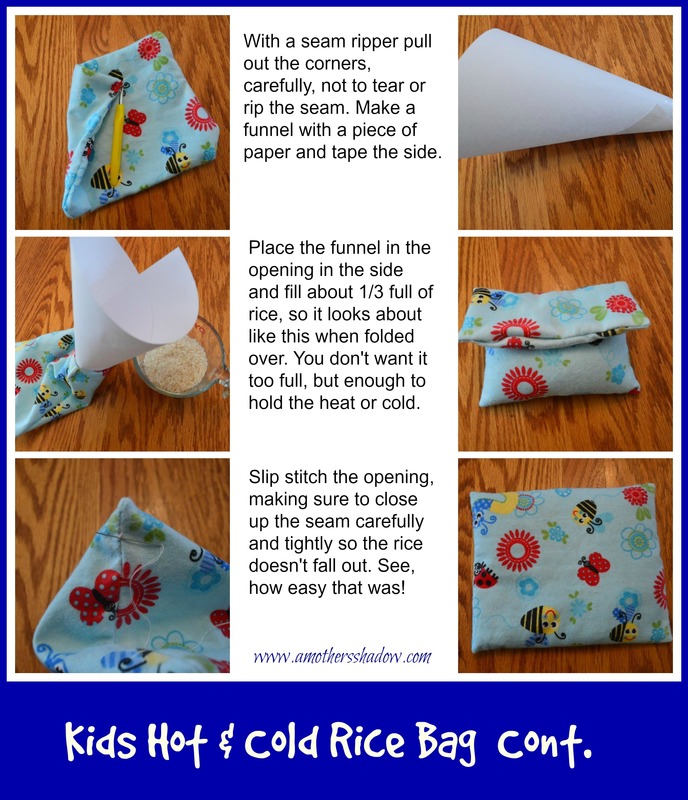 If you make the rice bags too small, they will lose the heat fast or chill very quickly. 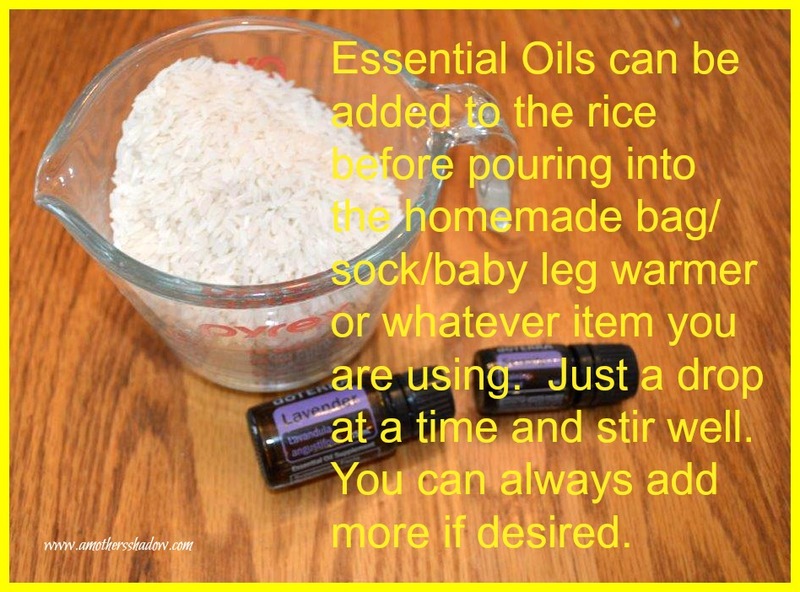 Rice – Jasmine (oh, the smell when heated is divine and it is the BEST filler of all when compared to everything from what I researched anyway. Except you cannot launder it. Toss it when it’s used up and make a new one.) Any type of rice will work. This one is sssooo easy, it just can’t be quicker than this. Fabulous to wrap around your neck, an ankle, or anywhere you’d like. Any long sock you desire. A tube sock without a heel works well. 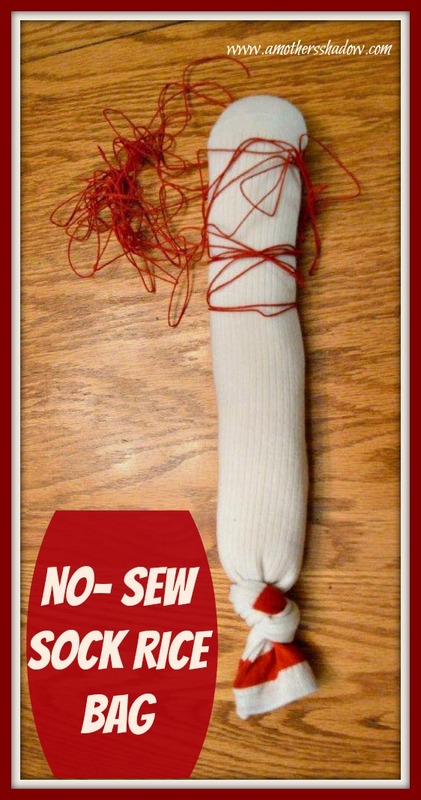 This is a fabulous way to use up those stray long toe socks, dad’s tube sock, holiday or decorated socks – any will do. 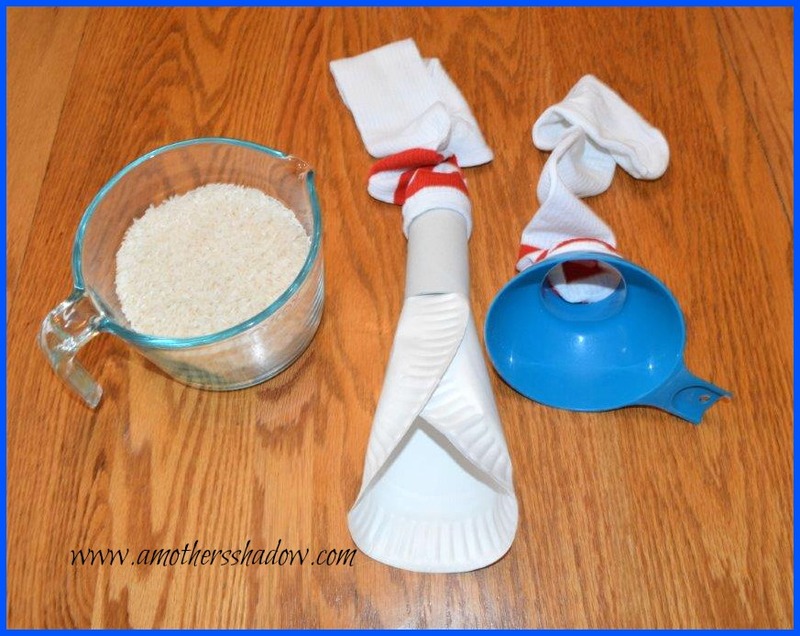 Using a toilet paper roll and a paper plate as a funnel, Or a funnel, fill the sock about 1/3 full of rice. Tie in a knot securely. When heating, place in the microwave with a cup of water and heat for 1-3 minutes. Shake to distribute heat and see if it needs to warm a bit longer. Since there are two, keep one in the freezer. I happened to get some of these on a fantastic sale and look what I made! You can do the same with baby leg warmers you might have around your house, or that you find on clearance at the store too. This is slick and takes about 5 minutes! Tie one end of the baby warmer tightly with bakers twine. 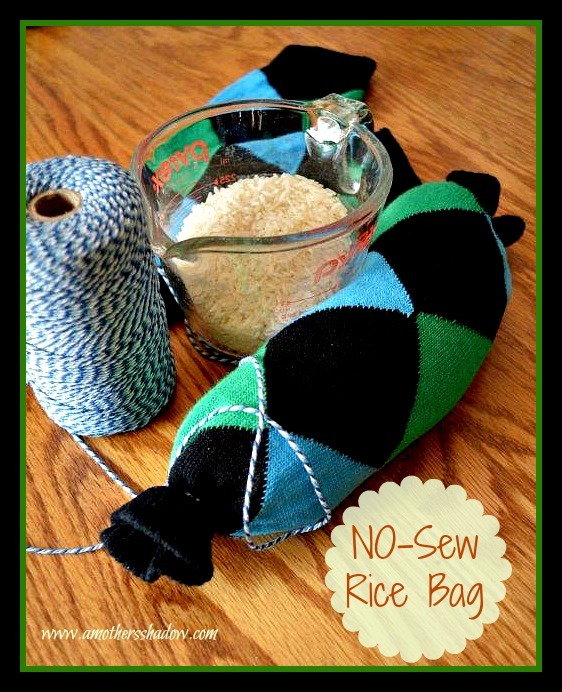 Using a toilet paper roll Or a funnel, fill the sock about 1/2 full of rice. Tie the other end closed with a knot securely. Having these on hand for those bumps, and boo-boos will quickly dry tears and reduce swelling too. Easy and quick to have on hand for those little emergencies. When heating, place in the microwave with a cup of water and heat for 1-3 minutes. Shake to distribute heat and see if it needs to warm a bit longer. Optional – keep one in the freezer. 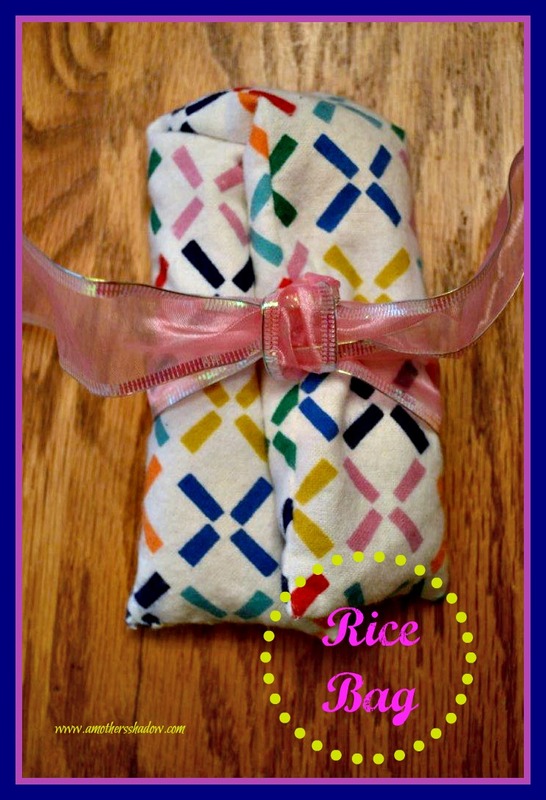 Instructions for the following Rice Bags pictured below. I have a couple of sizes to give you options so you can see what will work best for your needs. The long tube for your neck, the small for on the jaw or head and the larger on the back or shoulders would be perfect. Place fabric with right sides together and pin. Sew all the way around leaving a 4″ opening. Turn right side out, pulling the sides out. Using the seam ripper pull out the corners, carefully, not to rip or tear the fabric. Fill with rice about 1/3 full. Either slip stitch the opening, careful to make sure it is tight and close stitches so the rice doesn’t fall out. OR sew on the outside using the sewing machine.